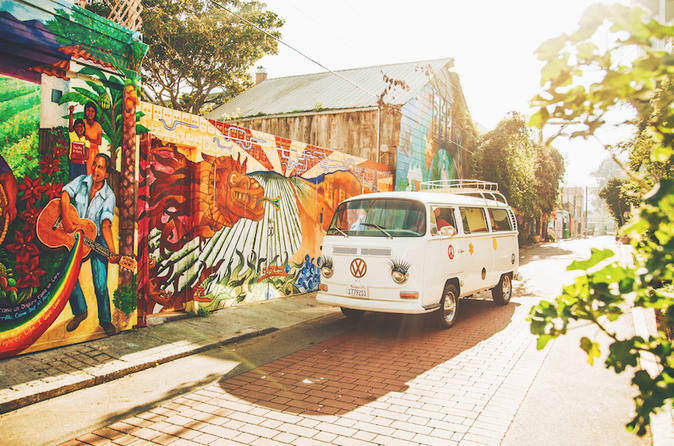 Enjoy a private tour for friends and family in a restored vintage Volkswagen Bus. Our private tour option is a great way to make your visit to San Francisco Memorable. We can customize your itinerary to suit your interests. Whether you would like to see the city highlights in a private setting, or drive down Highway 1 for a beer, we will work with you to come up with the perfect plan for your day! No matter what the occasion, we would love to make your day special! What makes our company unique is we have the vision of “ where vintage meets modern” we have USB ports in our bus, we have our buses fully restored and updated with modern amenities - and we are small buses so we can go to places that bigger buses are not allowed to: Twin peaks, Lombard Street, the Painted Ladies and the Full House, mural alleys in the Mission etc. We also offer complimentary light snacks and water in the morning, and complimentary local crafts beer and California wine on our afternoon tours and Private tours. Guests can also BYOB. We will gladly pick you up from your hotel, or in the Fisherman's Wharf and Union Square areas.